Looking for an Answer to a specific question? Looking for some direction? Looking for some validation of the path you're on? or just looking for guidance from the cards. A card reading can be any or all of these. Tarot and Oracle cards are divination tools that have been around since the 15th century, and have brought peace, comfort, insight and joy in times of challenge to literally countless individuals. All readings are done while I'm in meditation with which ever deck I am drawn to using for each specific clients question. 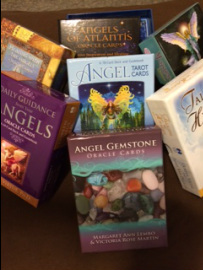 I work with you via email to determine what direction you are looking for and tap into the vibrational energy of the cards to get you the guidance that is there for you. RELATIONSHIPS - Are you looking for some insight from the Angels, Guides and Spirit into a current relationship, such as what are the strengths in this relationship, what are the weak areas of this relationship, what can I learn from the past, present, future of this relationship, what is the message from Spirit in this relationship? Or are you Single and looking for insight into what you should look for in a relationship, what lessons can be learned from Past and Future relationships, What your strengths in a relationship are and what you need to get out a balanced relationship and of course the message from Spirit regarding relationships for you. Whether you are looking for love or looking to strengthen an existing relationship, a card reading can offer you some insight and guidance to help see the strengths and the pitfalls in finding that perfect union. When booking for this reading, please be sure to mention whether you are Single and looking for love, or whether you are in a current relationship so I can tailor the reading to your situation. Sending loving vibrations your way. *please note that due to the increase in requests it can take 2-3 days to get your reply. I always attempt to turn readings around as quickly as possible. Please be sure to add Trish@thepeacefulhealingtree.com to your accepted contacts list.